Jorge Lorenzo has clinched pole position for the Tissot Australian Grand Prix, ahead of Marc Marquez and Valentino Rossi after a highly dramatic shootout at Phillip Island. The Yamaha Factory Racing rider clinched his third pole of the campaign – his first since Jerez in May – courtesy of a best lap of 1’27.899, but this was only after his bike clipped a seagull. 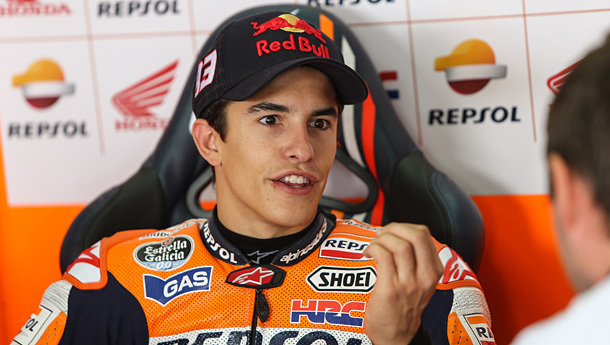 Will 20 year-old rookie Marc Marquez produce something special at Phillip Island tomorrow? Repsol Honda Team’s Marc Marquez will be able to secure the world crown on Sunday if he ends the race with a points advantage of 51 or more. The 20-year-old rookie has now also amassed a points margin large enough to become unassailable in the BMW M Award, successfully winning the prize on his first attempt. Lorenzo’s team-mate, Valentino Ross will start on the front row for the second consecutive race, ahead of GO&FUN Honda Gresini’s Alvaro Bautista who qualified fourth but went off-track at the end of qualifying. Fifth will be Sepang winner Dani Pedrosa (Repsol Honda Team) – who is the only rider other than Marquez and Lorenzo with a mathematical possibility of winning the championship. Monster Yamaha Tech3’s Cal Crutchlow, will start from sixth position. 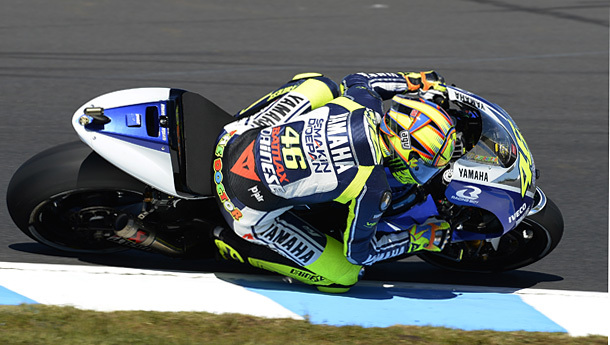 Valentino Rossi is happy with his front row start. Row 3 will be occupied by Tech3’s Bradley Smith plus Ducati Team pairing Nicky Hayden and Andrea Dovizioso. Tenth on the grid will be Energy T.I. Pramac Racing’s Andrea Iannone, who entered the Q2 shootout from Q1, as was also the case with Dovizioso. It was towards the end of Q1 when Iannone was involved in an on-track disagreement with Power Electronics Aspar’s Aleix Espargaro, who failed to feature in Q2. Colin Edwards set the CRT pace as he qualified 11th for NGM Mobile Forward Racing, ahead of Randy de Puniet, while the Frenchman’s team-mate Espargaro will be 13th on the grid; both de Puniet and Edwards suffered incidents in the Q2 shootout. Australian Bryan Staring will start his home race 21st on the Gresini CRT bike, while fellow countryman Damian Cudlin who is taking over from Yonny Hernandez at PBM will start from 23rd position. Honda LCR’s Stefan Bradl has withdrawn after testing his newly fractured ankle in Friday morning practice. Hernandez continues to replace Ben Spies at Pramac Ducati, and World Supersport-ace Scassa replaces the injured Karel Abraham at Cardion AB. Phillip Island has been resurfaced since last year’s event – after Friday practice, Bridgestone specified that all riders must use the harder rear for the race due to increased tyre wear. However, the short qualifying shootout meant that the softer rear was used without issue.